"I developed the program to provide our students with a pathway for understanding the various facets of HR within different industries and to begin developing their professional networks," Mervosh explained. Based on their professional interests, students were matched with a variety of employers including Aerotech, Pitt Ohio, Visit Pittsburgh, Omni William Penn Hotel, BNY Mellon, PPG, UPMC and more. "The networking event was a great success. The HR partner employers spent the evening discussing opportunities they could provide for the students such as shadowing, corporate visits, etc." Mervosh said. "I decided to attend the event because I knew what a great networking and learning opportunity it would be. Professor Mervosh is committed to our growth in the classroom and through real-world experiences with industry professionals. I am excited for the many future learning opportunities with my HR partner employer." "I feel like I've already learned so much from Shameia! She's taught me a lot about what to expect in a fast-paced work environment and provided me with many opportunities to job shadow various aspects of HR. Events like this are incredibly beneficial to students! As a college student, it isn't every day you get to have a conversation or work with a professional in your field." "The moment I heard about the HR Partner Program, I was excited. This is a great opportunity to meet professionals in the field who can provide me with advice and first-hand knowledge about working in HR. 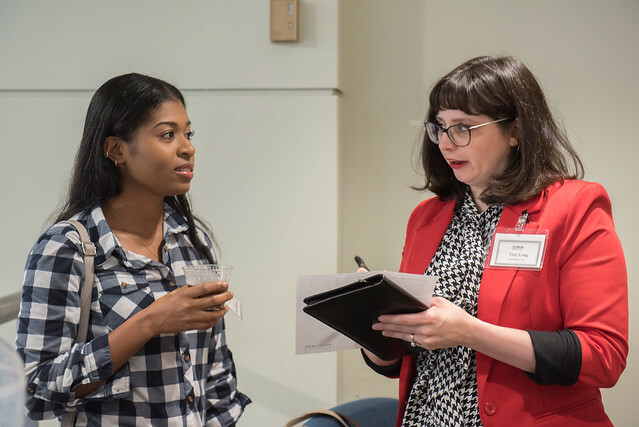 This event gave us the opportunity to improve our networking skills and build professional connections." "I value hard and integrity - all attributes that the HR professionals in our partner program have and I'm honored to learn as much as I can from them. Not every student is able to find a mentor on his or her own so I appreciate our wonderful professor setting up these beneficial partnerships." "This event allowed me to meet my HR employer partner face-to-face for the first time. He invited me to the Pitt Ohio Summit, which will focus on an area in HR I'm very interested in - recruitment. Having a connection to someone who has experience in your field is so important."